The Angel Meadows excavation has entered its second week and the team are hard at work finishing the cleaning of the archaeology on Plot 2 (Mincing Street), and the process of recording has started with the completion of a GPS survey and extensive photography. This will be completed later this week with the use of a drone to accurately survey the remains. Cleaning of the structural remains is now being undertaken on Plot 5 (Ludgate Hill), to properly define the features our excavations have revealed there. Preliminary comparisons between the Plot 2 site and historic mapping are allowing the team to begin the work of understanding how the layout of the dwellings in the area changed over time. The documents available to us show buildings were remodelled and removed, courtyards and alleys were extended, and points of access were changed over a period of 100 years. Evidence can be seen of this on the ground existing in the form of blocked doorways, truncated walls, and areas of more recent building superimposed over older foundations. The reasons for these changes isn’t always immediately clear, but some may relate to the efforts of the social reformers who during the later part of the nineteenth century, were (rightfully) concerned that the dark, squalid, and utterly unsanitary, cramped conditions of the area were contributing to the spread of disease and crime and high mortality rates. Perhaps the most significant indication of these changes is the addition of later sanitation works. These took the form of proper drainage and toilet blocks, much-needed facilities in ‘The Meadow’ and a response to legislation introduced in the mid-1800’s, making such facilities a legal requirement for existing housing, as well as new buildings. In several examples on site, later structures can be seen and have been built onto and over the old to incorporate these amenities. 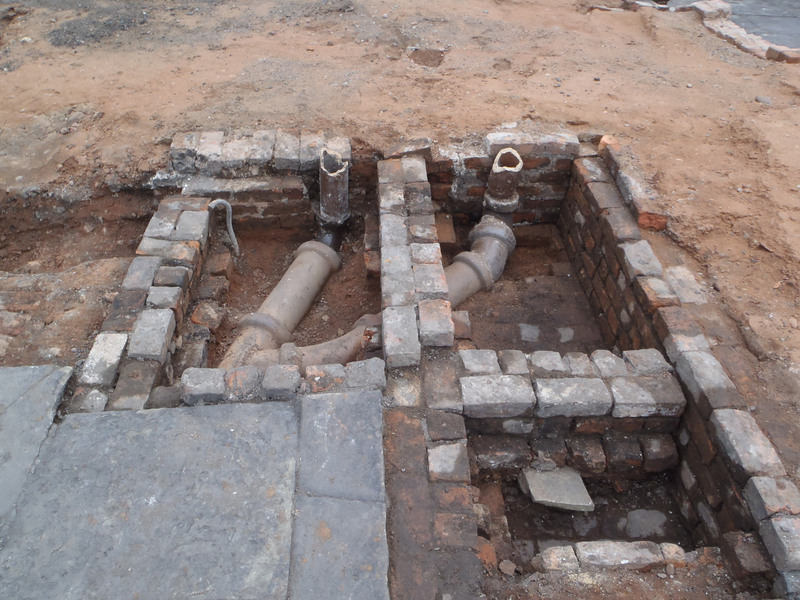 It’s a strange thing to portray lavatories as a ‘highlight’ of an archaeological site, but the implementation of basic plumbing is representative of the wider initiative to improve conditions for the working classes in Angel Meadow during the Industrial period. It will be interesting to see what other evidence of the conditions will be found and what the excavation further reveals.